Runners no longer have to enter a race to compete with other runners in their area. Since Strava took to the streets, runners have been able to compete against each other wherever and whenever they want. But what is the most competitive segment in your area? What crown truly makes you the king? Here’s a look at some of the most competitive segments in Calgary and Edmonton. With more than 22,702 attempts on this Strava segment, the Chasquis Mile is both popular and competitive. The segment is in the centre of the well-known River Valley in Edmonton, which is popular with both runners, cyclists, and everyday pedestrians. Although it’s a paved bike path, cross the river on a trail run to access the Chasquis Mile for a speed workout. Kampus Kilometre – Edmonton, Alta. The Kampus Kilometre is actually just under that distance and located on the outskirts of the University of Alberta Forest Reserve. 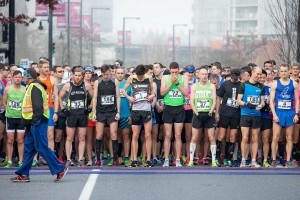 At 22,281 attempts, it’s a very competitive segment, with elite Canadian runners like Reid Coolsaet and Sasha Gollish gracing the top of the list. Emily Murphy Hill – Edmonton, Alta. Just beyond the Kampus Kilometre is Emily Murphy Hill. The segment has been attempted 23,444 times and at a seven per cent grade, it’s no joke. Wolf Willow Stairs – Edmonton, Alta. A slightly less competitive segment than the others, but if stairs are your thing then check out Wolf Willow. This segment is a little further from the downtown core toward Patricia Ravine and Riverbend. Bow River North – Calgary, Alta. Head south to Calgary to find the Bow River Pathway, where from Centre Bridge to 14th street it’s segment as far as the eye can see. U Sports cross-country fifth-place finisher Melissa Jones has the current CR, with 2017 Canadian Marathon Champion Trevor Hofbauer second on the men’s list. At over 30,000 attempts, this is a fun segment to take a run at. Crescent Hill Heights – Calgary, Alta. Colloquially known as the Death Run, Crescent Hill Heights is located on the Sunnyside Pathway which is right downtown and is a steep climb for 320 metres. At over 20,000 attempts, this is one of the more competitive segments in the city.